All activities on Earth, both natural processes and human-made processes, produce some type of byproduct from that activity. Under normal conditions these byproducts, some known as pollutants , are returned back into the environment. In fact, natural environmental processes have the ability to assimilate some pollutants and correct most imbalances if given enough time. However, if a persistent overload of a pollutant is allowed to continue or the pollutant is not a substance that the environment can handle, then the environment has little chance to "self-clean." This drainage outlet delivering polluted runoff into the Ohio River is a point source of pollution because the pollution originates from a single, identifiable source. cases, the natural system may not have any of the substance present until human activities add it to the environment. Pollution originating from a single, identifiable source, such as a discharge pipe from a factory or sewage plant, is called point-source pollution. Pollution that does not originate from a single source, or point, is called nonpoint-source pollution. Liquid, solid, and airborne discharges from point sources as well as pollutants from nonpoint sources may go either into surface water or into the ground. (Airborne pollutants can be assimilated into rainwater and can affect water quality: acid rain is an example.) The ability for these pollutants to reach surface water or groundwater is enhanced by the amount of water available from precipitation (rain) or irrigation. Point-source pollutants in surface water and groundwater are usually found in a plume that has the highest concentrations of the pollutant nearest the source (such as the end of a pipe or an underground injection system) and diminishing concentrations farther away from the source. The various types of point-source pollutants found in waters are as varied as the types of business, industry, agricultural, and urban sources that produce them. Commercial and industrial businesses use hazardous materials in manufacturing or maintenance, and then discharge various wastes from their operations. The raw materials and wastes may include pollutants such as solvents, petroleum products (such as oil and gasoline), or heavy metals . Point sources of pollution from agriculture may include animal feeding operations, animal waste treatment lagoons, or storage, handling, mixing, and cleaning areas for pesticides, fertilizers, and petroleum. Municipal point sources might include wastewater treatment plants, landfills, utility stations, motor pools, and fleet maintenance facilities. For all of these activities, hazardous materials may be included in the raw materials used in the process as well as in the waste stream for the facility. If the facility or operator does not handle, store, and dispose of the raw materials and wastes properly, these pollutants could end up in the water supply. This may occur through discharges at the end of a pipe to surface water, discharges on the ground that move through the ground with infiltrating rainwater, or direct discharges beneath the ground surface. Some of the most persistent point-source pollutants in groundwater are volatile organic compounds , which include manufactured and refined toxic substances such as solvents, oils, paint, and fuel products. In general, it takes only a small amount of these chemicals to raise health concerns. For example, approximately 4 liters (about one gallon) of pure trichloroethylene, a common solvent, will contaminate over 1 billion liters (300 million gallons) of water. Once groundwater is contaminated, it is difficult, costly, and sometimes even impossible to clean up. Nutrients (such as nitrogen and phosphorus). Temperature increases and nutrients can result in excessive plant growth and subsequent decaying organic matter in water that depletes dissolved oxygen levels and consequently stressing or killing vulnerable aquatic life. Microorganisms can be hazardous to both human health and aquatic life. Pesticides and other toxic substances can also be hazardous to both human health and aquatic life, but are less commonly found in surface water because of high dilution rates. Nonpoint-source pollution occurs as water moves across the land or through the ground and picks up natural and human-made pollutants, which can then be deposited in lakes, rivers, wetlands, coastal waters, and even groundwater. The water that carries nonpoint-source pollution may originate from natural processes such as rainfall or snowmelt, or from human activities such as crop irrigation or lawn maintenance. 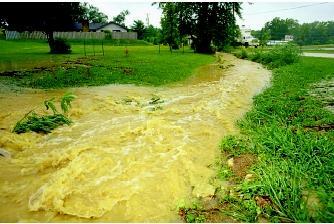 Nonpoint-source pollution is usually found spread out throughout a large area. It is often difficult to trace the exact origin of these pollutants because they result from a wide variety of human activities on the land as well as natural characteristics of the soil, climate, and topography . This silt-laden runoff from a residential area contains not only soil and clay particles from nearby construction, but also is likely to contain small amounts of lawn chemicals, oil, grease, gasoline, and even residues from recent highway de-icing. These are all examples of pollutants released from nonpoint sources. other aquatic species. Nutrients, microorganisms, and other toxic substances can be hazardous to human health and aquatic life. People can contribute to nonpoint-source pollution without even realizing it. Nonpoint sources of pollution in urban areas may include parking lots, streets, and roads where stormwater picks up oils, grease, metals, dirt, salts, and other toxic materials. In areas where crops are grown or in areas with landscaping (including grassy areas of residential lawns and city parks), irrigation, and rainfall can carry soil, pesticides, fertilizers, herbicides, and insecticides to surface water and groundwater. Bacteria, microorganisms, and nutrients (nitrogen and phosphorus) are common nonpoint-source pollutants from agricultural livestock areas and residential pet wastes. These pollutants are also found in areas where there is a high density of septic systems or where the septic systems are faulty or not maintained properly. Other pollutants from nonpoint sources include salt from irrigation practices or road de-icing, and acid drainage from abandoned mines. Over the years, federal laws and regulations have established a process for the U.S. Environmental Protection Agency (EPA) and the states to regulate point sources of pollution through issuing of permits that limit the types and amounts of pollutants a facility can discharge. In addition, there are many laws and regulations that mandate the ways that hazardous materials are handled, stored, and used. Those same laws and regulations often encourage voluntary pollution-prevention efforts to reduce and minimize the use of potential pollutants. These laws, regulations, and voluntary efforts have helped clean up major water quality problems and reduced the amount of pollutants directly discharged to surface water and groundwater. However, EPA reports that more than one-third of the nation's waters are still not meeting water quality standards. 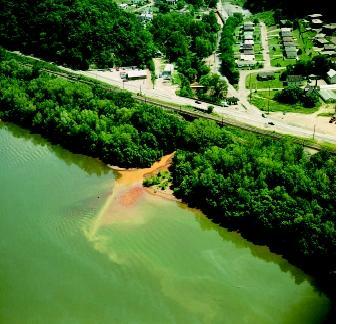 Nonpoint sources of pollution have been identified as the primary reason for these continued problems. Preventing and controlling nonpointsource pollution is primarily accomplished through regulation under the Clean Water Act and voluntary watershed protection efforts. Best management practices and pollution prevention can be applied at the local, state, and federal level to reduce and prevent nonpoint-source pollution. Some activities are federal and state responsibilities, such as ensuring that public lands are properly managed to reduce soil erosion, or developing legislation to govern chemical use. Many other regulatory approaches are best handled locally, such as by zoning or erosion-control ordinances. Each citizen can play an important role by being active in the community, learning more about the local watershed, practicing conservation, and by preventing pollution in homes, yards, and neighborhoods. SEE ALSO Chemical Analysis of Water ; Chemicals from Agriculture ; Clean Water Act ; Landfills: Impact on Groundwater ; Pollution of Groundwater ; Runoff, Factors Affecting ; Septic System Impacts . Zoller, Uri, ed. Groundwater Contamination and Control. New York: Marcel Drekker, Inc., 1994. NonPoint Source Pointers (Factsheets). "NPS Home." U.S. Environmental Protection Agency (EPA), Office of Water. Nonpoint Source Pollution Pointer No's 1 through 7 EPA841-F-96-004(A through G) <http://www.epa.gov/OWOW/NPS/facts/index.html> . Polluted Runoff: Nonpoint Source Pollution. U.S. Environmental Protection Agency, Office of Water. <http://www.epa.gov/OWOW/NPS/> . i thought that this article was really great. you should put it on more websites if you already haven't. its really GREAT!